If you’ve lived here for any length of time, you’ve got your little secrets – those things that only locals know. Maybe it’s an off-the-menu item you love to order or a back road you take to the beach. We’d love hearing your hacks in our Facebook Group, but for now, here are 15 we’re passing on to you. Enjoy! According to one reader in our Facebook Group, you can visit LEGOLAND free for an hour anytime. Go to Guest Services for a shopping pass (they’ll keep your license and charge you for a full day if you’re late), and stay in the park for an hour. You’ll be reimbursed for the $17 parking if you spend $20 while shopping – but don’t go over an hour! Worth noting is that a lot of the LEGO stores sell hard-to-find sets that are not easily found elsewhere. For best results, call Guest Services before you visit to ensure the hour-free deal is still active. Bonus Tip: Once a year on Celebrate Carlsbad Day, LEGOLAND offers residents $30 park tickets. The 2017 date passed in April, but bookmark this website to stay on top of it for 2018. The same reader told us that the best way to get to La Costa from Encinitas Blvd. is to take Saxony. This tip comes in handy during busy summer traffic. Speaking of LC, a fellow North County fan suggested that when you’re driving south during traffic, use Vulcan to get from La Costa to Cardiff with relative ease. Another friend of North County recommends taking the train from Solana Beach to Oceanside for the town’s Thursday night farmers market. If you don’t want to drink and drive (and you don’t want to drink and drive), also consider hopping the train into Carlsbad Village for happy hour. If you’re headed the opposite direction, a fun day is to come to Solana Beach for its Sunday farmers market or walk across the street to urban winery tasting rooms. Round trip from Solana to O’Side is 8 bucks. From 7:30-9:30AM every Saturday and Sunday during the summer season you can watch the horses train. Park in the main lot off Jimmy Durante and go to the second-floor clubhouse entrance. Have breakfast at the open-air Clubhouse Terrace Restaurant, spend $25 on food, and they’ll knock off the $10 parking fee. Plus you’ll learn behind-the-scenes factoids from Jeff Bloom, a former jockey and event announcer. Artist Jack Lampl created Neptune’s Portal to encourage passerby to share a little piece of themselves by staring into the large glass flower sculpture – complete with a hidden camera inside – pressing record and leaving a recorded message for others to view later at neptunesportal.tv. The art installation sits on top of a Leucadia mailbox at 678 Neptube Ave. Recorded messages posted at the site seem to be missing for 2017, but don’t let that stop you. Don’t have a pool and don’t feel like visiting a crowded community swimming hole? 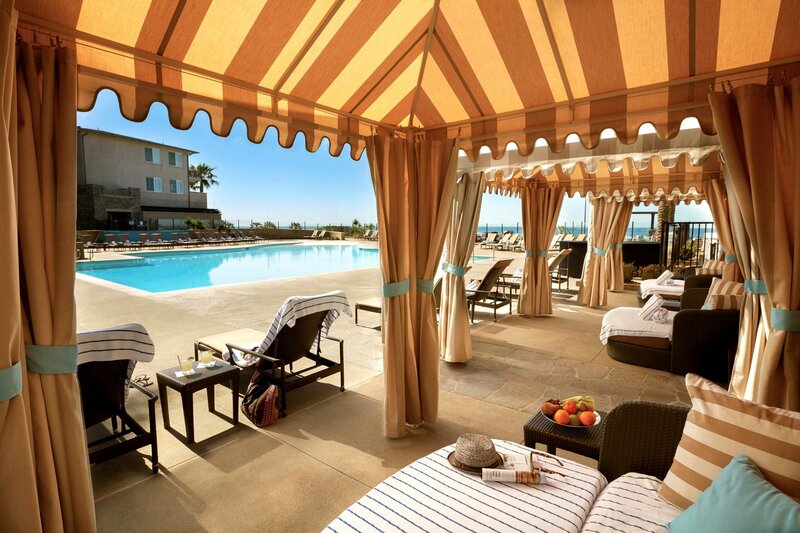 Rent a poolside cabana at Carlsbad’s Cape Rey Resort and daycation in style. Cape Rey lets locals rent a premium cabana for the day overlooking a family-friendly pool and the Pacific Ocean. You and your kids/guests/out-of-town visitors/just you will enjoy personal service, fruit and non-alcoholic drinks, free WiFi, TV, and a lot more. Cabana rentals are available for up to six people and cost $100 during the week and $150 on weekends. There’s also a minimum food/beverage to meet. Check the website for details. Although this hasn’t been independently verified, all Prepkitchens (the North County location is in Del Mar), offers a secret dish of fries with Bolognese sauce. Sources say diners just need to ask for “spicy BOLO fries” and your wish is Prepkitchen’s command. Visitors to Oceanside’s Hello Betty Fish House can reportedly order the “secret” Maverick’s Squeeze cocktail that pays homage to the iconic Top Gun house owned by Kelly McGillis’s character in the movie. The house sits near Hello Betty and those in the know can celebrate its proximity with Betty’s off-menu boozy surprise. Did you know that there’s a Miniature Engineering Craftsmanship Museum in town? It’s located in Carlsbad to be exact, and it contains the world’s largest collection of model engineering excellence. That means if you visit, you’ll be treated to hundreds and hundreds of metalworking and machine displays created by craftspeople from all over the country. Supported by a foundation established by the former president and owner of Sherline Products, the museum is free to visit and open Tuesdays through Saturdays from 9AM to 4PM. Insiders report that the best time to visit is during the machine shop/engine run demos at 10AM, noon and 2PM each day the museum is open. Note: wear closed-toe shoes. The museum is located at 3190 Lionshead Avenue in Carlsbad. This tip may not be North County-centric, but all North County residents would probably like to know that if they have a Bank of America credit or debit card, they get one free general admission to participating museums on the first full weekend of every month. Simply present your debit or credit card with a photo ID and you can score your gratis admission to the Birch Aquarium, Museum of Photographic Arts or the San Diego Museum of Art. Check this website for more details. This may – and probably does – happen at many area Vons stores, but we know for certain that the Vons on Scripps-Poway Parkway gives free cookies to kids who ask. Visit the bakery counter and if the cookies are there, your kid usually gets one. Sure makes bribing the kids to go grocery shopping with you much easier. You’ve surely seen all those “foot massage for $25” spots around town, and maybe you’re skeptical of their business dealings. All we can tell you is that several of these places offer amazing foot massages that very often include a full-body rubdown while your feet soak. Clothes stay on – this is a foot massage after all – but you get your money’s worth. Go in expecting just a foot massage for $25-$30 and come out with arms, legs, neck, and back also massaged for an hour? That’s a deal. One place we can vouch has an epic foot rub with the legal extras is Serenity Spa on Poway Rd. Escondido’s Stone Brewery offers inexpensive, guided tours of its facility every weekday at noon, 2PM, and 4PM. Tours happen every hour on the hour from noon to 6PM on the weekends. Tours run for 45 minutes and conclude with beer tastings. Tour passes cost $3 or a buck for those not drinking. Spill your North County secrets!